Could Our Lives Exist Within Two Timelines? The science aspects and ideas presented in my book Anomaly (The Soul Prophecies), particularly the proposal of a new and separate timeline, have sparked discussions amongst science lovers, professors and students online. Although the idea is not new, the approach is, and it could explain Dark Energy, Dark Matter, The Expanding Universe and the conditions before the Big Bang. This new and secondary timeline is referred to as Nowtime in Anomaly, where Nowtime holds all cosmological information. The Saganist Wordpress Blog; Could Dark Energy be Another Dimension of Time? covers the ideas behind Nowtime in more detail. ‘I didn’t think I was going to get my journal back,’ she said as she sat back down. Kyle raised an eyebrow and drew her book from his bag. ‘Of course not.’ Sophia smiled. She took her journal eagerly and began flipping through it. ‘It seems like I’m collecting books lately,’ Kyle said. Sophia gasped; her eyes widened and her mouth hung open but curved upwards as though she had been caught in the midst of laughter. He wondered if he should apologise for the mess he’d made of her work. ‘This is brilliant,’ she said excitedly, almost bouncing in her chair. Her dark eyes gleamed with something that was both incredible and frightening. ‘It is?’ Kyle said, slightly taken aback. ‘Yes!’ she said and then she frowned at him. ‘Sit down,’ she said agitatedly. He did as he was told and took the chair opposite her. ‘Ah, we’ll come to that later,’ she said, waving a hand in the air. ‘Each loop gets bigger as regular time moves forward because the information in the universe is growing, hence entropy is growing, hence the universe is expanding.’ Her words seemed to be jumping from her mouth. ‘I’m not sure how you would explain the beginning of time with these timelines…’ Kyle said. ‘What do you mean?’ Kyle asked sceptically. ‘Right.’ Kyle frowned. He wasn’t sure where she was going with this line of thought but he wasn’t entirely sure he liked it. Science is not the only subject highlighted in Anomaly. The novel focuses on the human mind, emotions and life after death. Life decisions and where they may take you is also a key theme running throughout the story. The main character, Kyle Hunter, represents the idea that life may not always be kind and its ok to make some mistakes, but happiness is largely a choice, and you have the freedom to change your mind at any point during your life. Have you ever wondered what your life would be like now if you had made different decisions in the past? Do you know that even your smallest decisions may have a huge impact on the world? There are hidden messages and metaphors throughout Anomaly that are relatable to young adults and adults alike. Despite being classified as a paranormal fantasy Anomaly branches into many different genres. 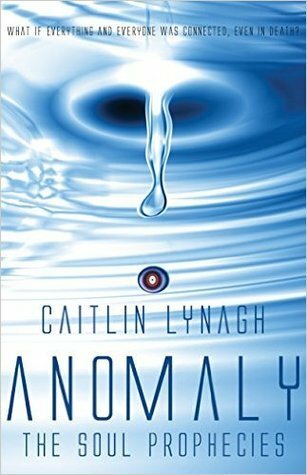 Caitlin Lynagh is a blogger, writer and author of Anomaly (The Soul Prophecies). She currently writes the blog series ‘Diary of a Young Writer’ where she discusses her experiences with publishing a book and gives out writing advice and tips. She won the North West Young Writers Grant and graduated from Keele University with a BSc in 2013. She enjoys learning new skills, and is always looking for her next creative pursuit. Caitlin has traveled both to the Amazon and to Hong Kong, but spends most of her time letting her imagination run wild and tapping away on her laptop. Despite having long and unusual working hours she never fails to make time for friends and family, and above all else she confesses she is a stereotypical author who loves bookshops, reading and cups of tea.